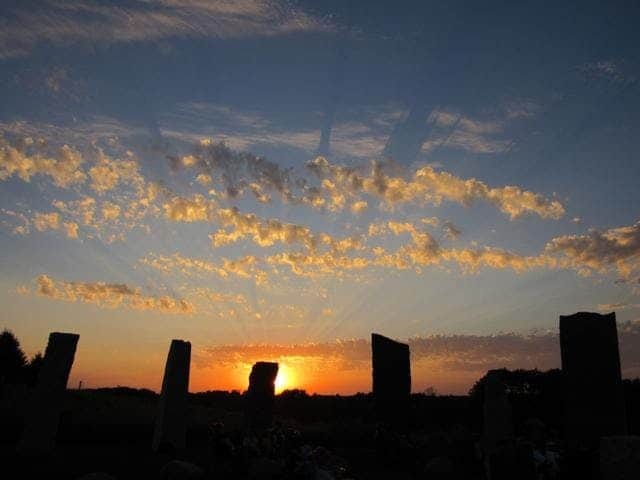 At Kinstone we take time to recognize the passing of the seasons with intentional events that remind us to honor our home in this part of the Universe. Join us as we greet Summer with a mystical, magical, musical welcome on Midsummer Day (a.k.a. 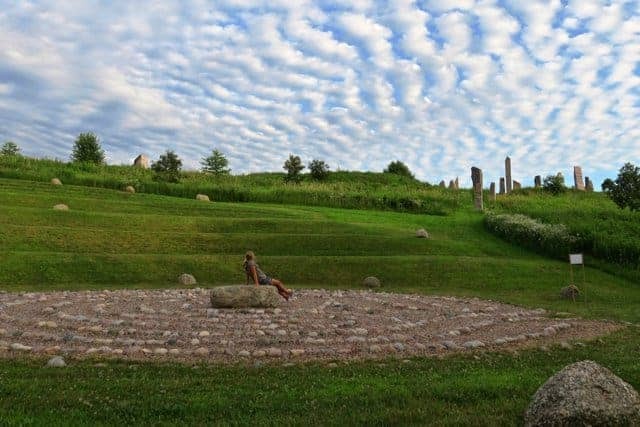 Summer Solstice) in the large Stone Circle. Experience the incredible, transformational sounds of Peter Phippen and Rahbi Crawford. They are master musicians who improvise and collaborate with great effect. The blending of flutes and crystal singing bowls will get right into our hearts and souls. 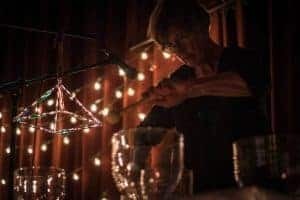 Special guests Victoria Shoemaker (wooden and crystal flutes) and Brian Reidinger (percussion / drums) will also perform. 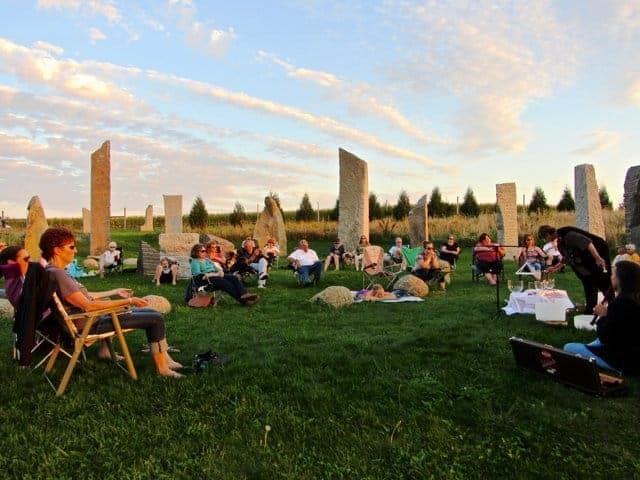 These world class musicians will take us on a sound journey as we sit amidst the standing stones of Kinstone Circle. They will enchant us with their sacred sound even as they lull the sun to sleep at sunset. 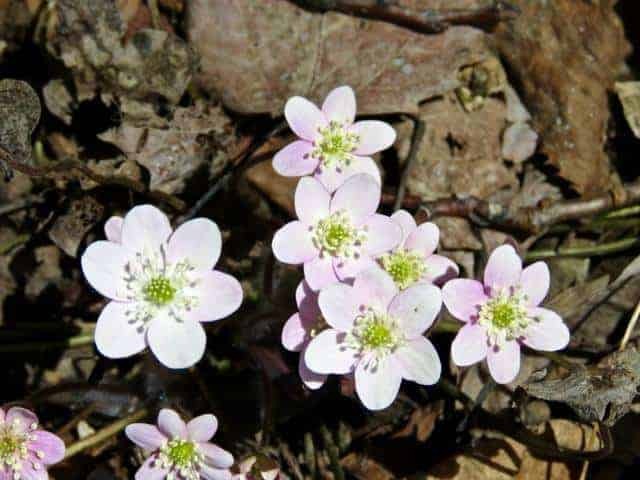 As always, the musicians will join the breezes and the host of singing creatures living in and around the fields, forests and waters of Kinstone. Magical indeed. IMPORTANT: This is a non-smoking, alcohol free, kid-friendly event. This event will be held rain or shine. If the weather is not ideal for outdoor listening we will hold this event inside the Kinstone Education Center. No refunds. Date: Friday, June 21, 2019 Time: 6:30 pm Tickets: $15.00 up to 24 hours in advance, $20.00 at the door. Kids 12 & under are FREE but must be accompanied by an adult registered for the event! No refunds. Purchase tickets through Eventbrite by clicking HERE or by clicking on the link labeled “Website:” in the right-hand column on this page; your printed receipt is required for entry. Pay at the door (cash only) is possible but requires a reservation in advance, so if you plan to come and pay at the door please CONTACT US to register! Advanced payment is preferred. NOTICE: Bring your own chair or blanket to sit on. Dress for the weather and bring your own insect repellent and/or sunscreen if needed. A flashlight may be helpful if you stay until dark. Park in designated parking areas. Upon arrival, proceed to the Stone Circle (or the Education Center Classroom if raining). Peter Phippen is a Grammy Award Nominee, International Acoustic Music Awards Nominee and Native American Music Awards Nominee. 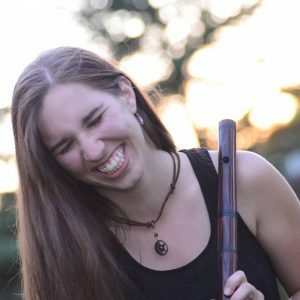 Phippen is a performer and recording artist specializing in traditional flutes from around the world. Over the last three decades Phippen has researched the history and performance technique of flutes both ancient and modern. Since 1993, Phippen has performed an enchanting mix of the very old and very new in music. Peter has shared the stage with R. Carlos Nakai, Coyote Oldman, and Xavier Quijas Yxayotl to name a few. As a recording artist for Canyon Records, Phippen has recorded four albums of original music. 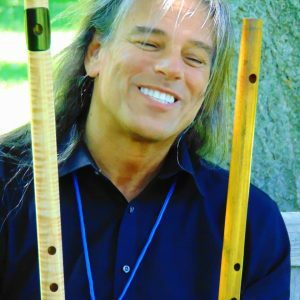 He was featured as flutist and composer on renowned Shamanic practitioner, percussionist and ceremonial leader Byron Metcalf’s “Inner Rhythm Meditations”, charting in the Top 20 of the Zone Music Reporter’s Top 100 from February to June of 2017 and nominated for a ZMR Music Award in the Best Relaxation/Meditation Album category for 2017. Phippen also contributed bamboo and wooden flutes on Byron Metcalf’s “Inner Rhythm Meditations Vol. II,” nominated for a 2018 ZMR Music Award and featured on the Journeyscapes Radio Top 25 albums of 2018. Phippen’s recordings have been aired on radio and television worldwide. In his approach to world flute performance, he is an experiential, natural folk musician with a penchant for creative and artistic musical improvisation. Peter offers a captivating collage of sound images, covering the folklore and history of flutes from around the world and throughout time. Learn more about Peter Phippen at his website: www.peterphippen.com. Rahbi (Roberta) Crawford has accepted her calling as a Musical Mystic. (Mystic: A seeker of Spiritual truths). She holds two Master Degrees, one in Music Education and another in Choral Conducting, and 6 years of advanced training in professional orchestral conducting organizations: including International workshops in the Czech Republic with the Zlin professional orchestra. Her sound healing training includes Levels I & II from Tama-Do, Academy of Sound, Color and Movement, in the South of France. Besides her extensive musical skill and training, Rahbi brings to her music her own emotional and spiritual depth. Rahbi has provided the background music for Mayo Clinic’s, “Mindful Movements: Gentle Yoga” DVD and has been giving presentations in the Mayo Clinic Cancer Education Center as part of its Creative Cancer Renewal Program. Learn more about Rahbi Crawford at her website: www.Rahbicrawford.com. Victoria Shoemaker grew up studying flute and piccolo. She went on to study bamboo flutes, native American style flutes, and other traditional flutes with Peter Phippen. In 2015, Victoria earned a degree in music education from the VanderCook College of Music. Shoemaker began teaching music in 2017 and has been nominated for the Wisconsin Area Music Industry (WAMI) People’s Choice Award for Best Music Teacher in North West Wisconsin in both 2018 and 2019. Shoemaker maintains an active performing schedule, and writes and records her own music. Learn more about Victoria Shoemaker HERE. Brian Reidinger is an accomplished drummer, composer, producer, and successful business owner. He studied piano for six years; from the age of nine, and discovered the drums, his lifelong passion, at the age of eleven. For the past 24+ years, he has been a founding partner, and longtime Creative Director/Chief Composer/Producer at Minneapolis based, In The Groove Music LLC ; crafting jingles, scores, and songs for television, advertising, news, sports, video games, etc. 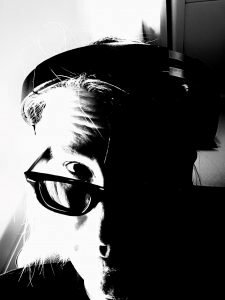 In 2019, he will be finishing a solo project, producing 34-tracks for Austin, TX based Drew Davis, and co-writing/producing a new World/Ambient collection with Peter Phippen and Victoria Shoemaker. Reidinger continues to maintain an ‘artist friendly’ studio and live schedule: including Joe Shaheen’s ‘The Wrong Omar’ project, for whom he played drums, mixed and produced his 2017 “Rockin’ Chair” release; drums for Laura Lou’s “Echo” release, and live performances with Minneapolis based, “The Twins Of Franklin“. He also collects wine, skis, plays golf, tennis, cooks whenever possible, and with his wife is the proud co-shepherd of a lively Bernese Mountain Dog. The ancient ones await this musical treat and your visit.